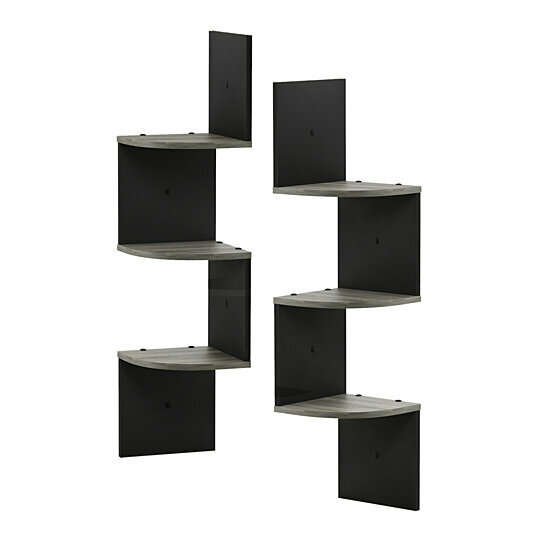 Furinno 3 Tier Wall Mount Floating Corner Shelf makes space utilization possible from any corner. Creative design provides space saving solution for small area. Display collectibles, photos, toys, awards, CDs, videos, decorative items and more. Attaches to both sides of the wall using only a few screws. Contemporary espresso finish makes it the ideal accent for any living space. A simple attitude towards lifestyle is reflected directly on the design of Furinno Furniture, creating a trend of simply nature. Care instructions: wipe clean using damp cloth. Avoid using harsh chemicals. Pictures are for illustration purpose. All decor items are not included in this offer. Easy mounting to the wall. Weight capacity is 3 lbs each shelf.